We have received several calls and emails from clients and neighbors concerned over a letter they received from Southern California Edison stating that their usage is 400% above the allowed baseline usage level and that they will now be charged a High Usage Charge. It’s important to know that this is NOT a result of you using more power than you were previously, but rather a change in how SCE is billing. 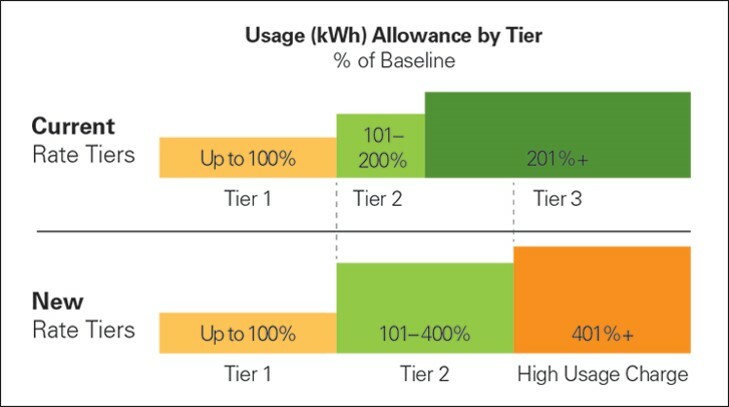 As they move from the recently adopted 3-tiered billing to now “2-tiers”, they call out tiers 1 and 2, and all usage above those tiers are now called HIGH USAGE and will be billed at .32 cents per kilowatt hour. Depending on your annual usage level you may see a slight rate increase with the new structure or in some unique cases a slight decrease. Energy efficiencies and solar are still the best ways to remedy high electric bills, and Hot Purple Energy is here to help you understand the best options for your home or business.